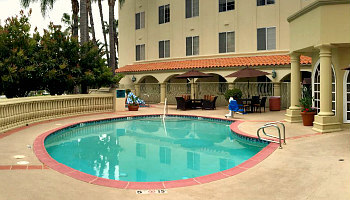 Whirlpool Suite in Orange County at the Hampton Inn & Suites, Santa Ana CA. Searching for a Orange County hotel with a private hot tub that's right in the room? 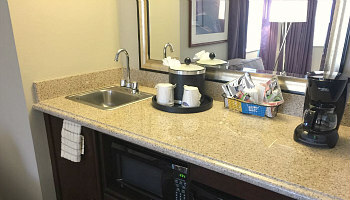 The Hampton Inn Santa Ana Orange County Airport is a fine choice that is both easy on the budget and located close to lots of restaurants, shopping and attractions in this area of Southern California. 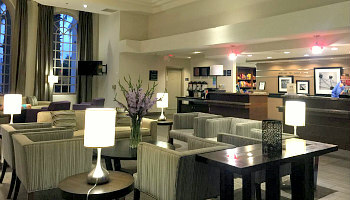 What Other Couples Like About The Hampton Inn Santa Ana Orange County Airport: Newport Beach only a short drive away - free hot breakfast - rooms and suites very spacious - good location with Disneyland about 20 minutes away - price quite affordable - helpful front desk people. 2018 ERV Rating* for Orange County CA Whirlpool Suites: 82% - Very Good. 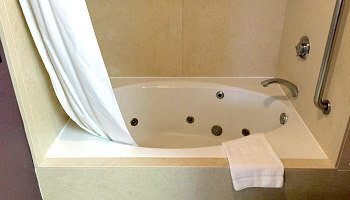 California Hotel Suites with In-Room Jetted Tubs - see more romantic hotels, inns and resorts with private Whirlpool tubs in Northern, Central and Southern California. 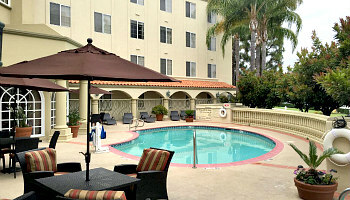 What's the Location of the Hampton Inn & Suites Santa Ana? What is this Hampton Inn Hotel Close to? 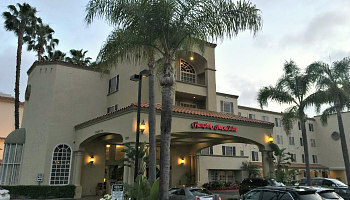 The hotel is only 3 miles from John Wayne Airport. South Coast Plaza shopping mall is about 4 miles away, and Disneyland is about 12 miles drive Northwest using I-5. 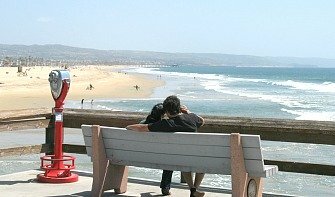 For beaches, Newport Beach is 8 miles away, and Huntington Beach around 11 miles. Yes, a free shuttle for the airport and destinations with a 5-mile radius. 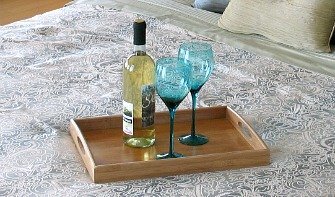 How Much Per Night Do Rooms with Hot Tubs Here Cost? 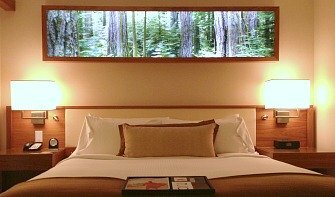 Can You Pay With Hilton Honors Points Here? Is the Tub a JACUZZI® Brand Tub? Is the Tub Large Enough for 2? 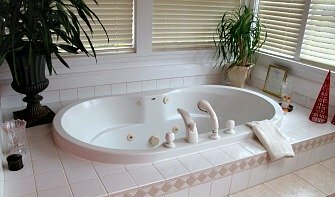 The tub is located in the bathroom, and we would say it's probably best suited to just 1 person. Is there a Fireplace in the Room? No, not at this hotel. Does the Hampton Inn Santa Ana Have a Pool? Yes, a heated outdoor pool. Are the Rooms and Hotel Location Quiet? 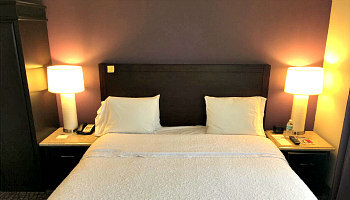 Although the hotel is located very close to the Costa Mesa Freeway (55), we found the room very quiet and seldom heard any outside traffic noise. Yes, $8/night, either self-parking or valet. No, but there are several restaurants located nearby.